An Exquisite Rendezvous with a Princess—and a private viewing of a spirited exhibit of couture fashions by Balenciaga, Givenchy and Venet. 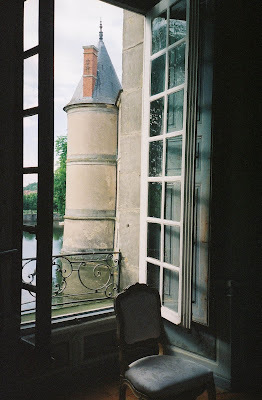 I arranged a private visit to Haroué (pronounced ah-rou-eh) last month when I was in Paris. It was one of my all-time favorite French adventures, thrilling in every way. 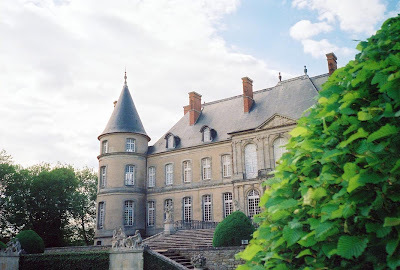 I had dreamed of visiting the mysterious eighteenth-century Chateau de Haroué in Lorraine ever since I saw romantic images of the exterior and the garden years ago in a French book on the most elegant historic private chateaux. Pictures of misty turrets and a moat with white swans, and graceful late eighteenth-century Chinoiserie murals by Pillement drew my attention. 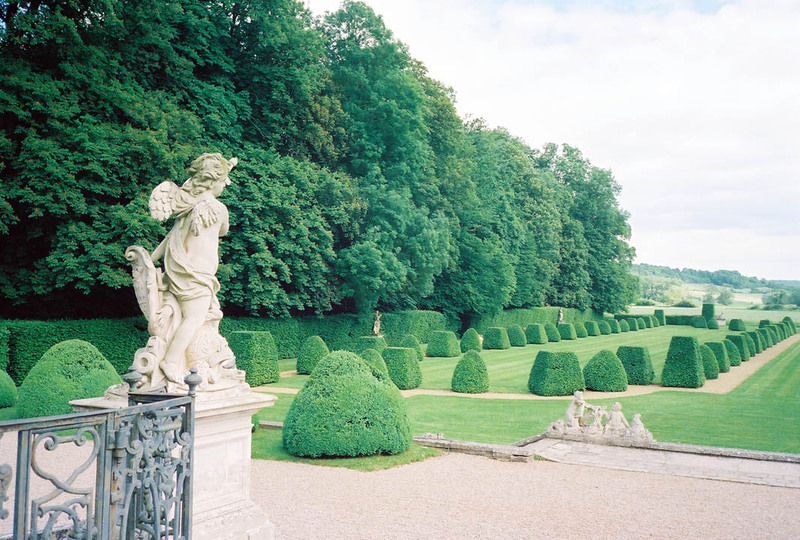 I saw images of a rigorous parterre of topiaries by Emilio Terry, and voluptuously appointed rooms with centuries of tapestries and boiseries and gold-tinged embroideries. 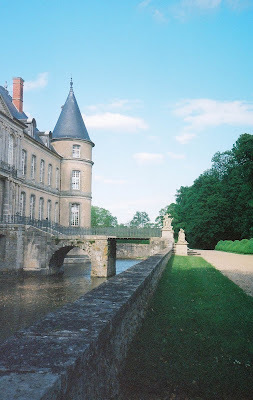 I later heard the name Haroué whispered when I visited other private chateaux, Vaux-le-Vicomte and L'Ainay-le-Vieil. 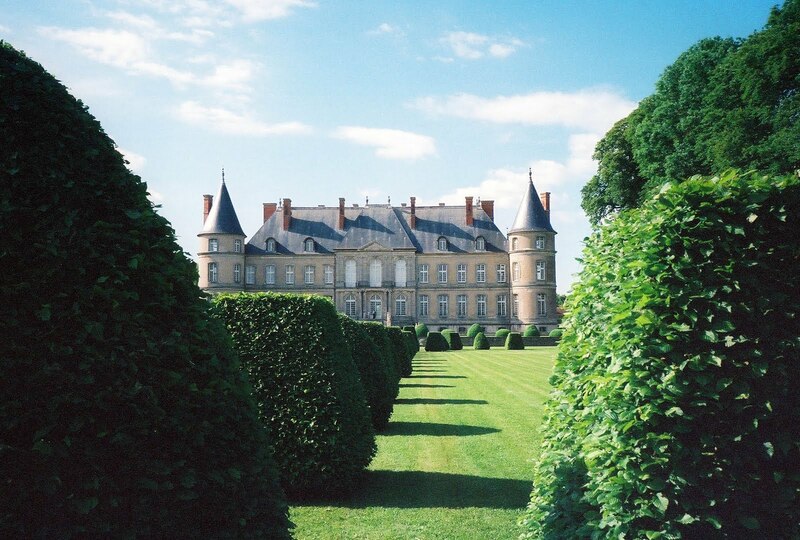 I was intrigued that the family still lives with grace and style and determination at the chateau. It is this very rare continuity, this passion for a house, an inheritance of style and of tradition that appeal to me. A private chateau lives and breathes, has seasons and celebrations, and traditions, and is carefully maintained and pampered. Laughter echoes in the stairways. Children grow up. Fresh flowers are in crystal vases in all the rooms. Gardens are manicured and perfect, and protectiv staff who’ve worked with the family for generations uphold the highest standards. Everything is comme il faut. First I had to get there. 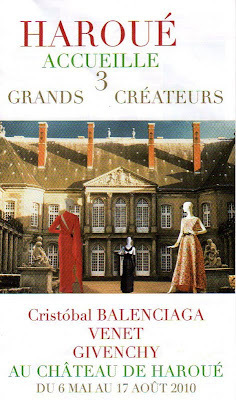 I made an appointment with the proprietor, Princess Minnie de Beauvau-Craon (her full name is Marie Minnie Isabelle Cristina Adèle Gracie de Beauvau-Craon) to tour the chateau and visit the Balenciaga Givenchy Venet exhibit. The quickest and most efficient route is by TGV. From the Gare de l’Est, I headed east in a first class seat (with a delicious sandwich from Gerard Mulot and a stash of Moleskines). The non-stop one-and-a-half hour trip to Nancy sped through endless landscapes of wheat fields and distant farmhouses, country roads and the occasional hilltop fortification. In the city of Nancy (noted for Art Nouveau buildings) I found a friendly taxi driver to take me on the one-hour drive south through the lush green fields and along the Moselle River to Haroué. 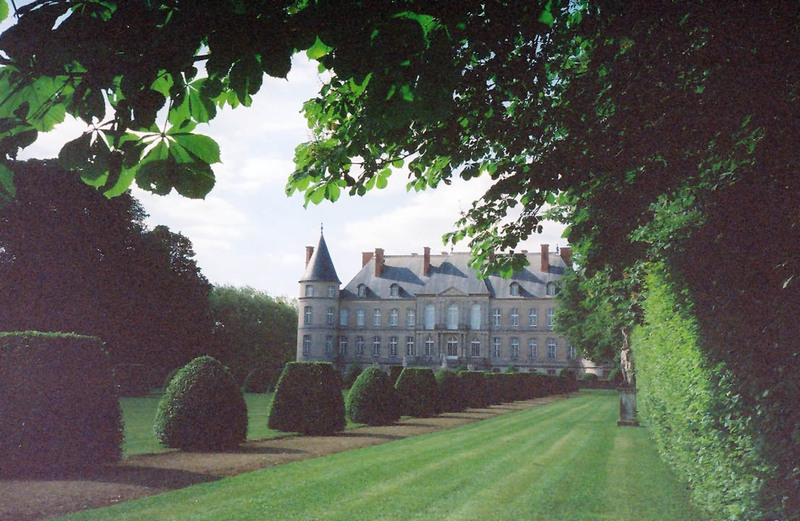 After this bucolic reverie, the chateau came into view, imposing and elegantly symmetrical behind grand iron gates. The fragrance of linden blossom drifted in the afternoon air as I entered this serene domain. And there was the princess, charming and gracious, with a plummy and posh and totally proper retro-English accent. She could not have been nicer. 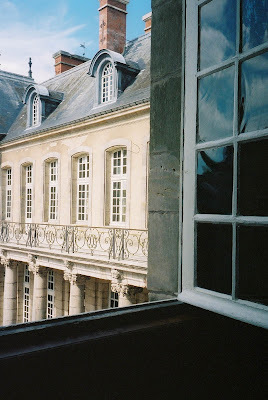 We chatted as we walked across the broad cobblestone courtyard, over the moat, up the limestone stairs and into the grand entrance gallery of the chateau. Up a Versailles-worthy staircase, we arrived at the Balenciaga Givenchy Venet exhibit. Princess Minnie explained that the show had been the idea of Hubert de Givenchy, a longtime family friend, who selected all of the 50 couture gowns in the presentation. 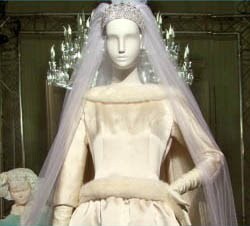 As strains of ‘The Swan’ from ‘Carnival of the Animals’ by Saint-Saens played on a soundtrack, the first gown, Balenciaga’s pristine mink-trimmed off-white duchesse satin wedding gown of Queen Fabiola of Belgium came into view beneath a dazzling Baccarat chandelier. To the right, another Balenciaga masterpiece, a simple long black silk crepe gown has a pale emerald evening coat, afloat with a tangle of curled ostrich feathers. Princess Minnie (who was named after her beloved grandmother) walked ahead of me spritzing the air with Jo Malone’s Orange Blossom cologne, all the better to enhance the atmosphere in the darkened rooms. One fierce Balenciaga creation follows another. It’s almost too much beauty. We walk silently (spritz, spritz) across the gleaming waxed parquet floor into the second room arrayed with designs from Givenchy’s archive. 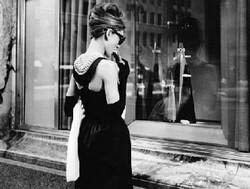 The sound track begins to play ‘Moon River’ from ‘Breakfast at Tiffany’s’, and I see the famous cut-out back of the black gown worn by Audrey Hepburn as Holly Golightly as she steps from a cab on Fifth Avenue at 5am, munches on a Danish, and gazes at Tiffany’s windows. “Moon River, wider than a mile, I’m crossing you in style one day…Two drifters off to see the world, There’s such a lot of world to see, We’re after the same rainbow’s end, waiting round the bend, Moon River, and me.” I could cry at the extravagant beauty of these rooms and the crème de le crème of couture. The gowns, here the cream silk zibeline embroidered dress worn to the Paris Opera by Jackie Kennedy, there pale rose tulle embroidered with flowers, here a bright yellow silk crepe gown with bodice and sleeves embroidered and set with tiny paillettes. The Princess leaves for a moment, and I wander through these vast rooms. I inspect and admire the embroideries and jewels and hand-stitching up-close, and linger before an off-white crepe gown by Philippe Venet or inspect the crystal-embroidered bodice of a white silk faille gown by Givenchy. The art and craftsmanship are breath-taking, the beauty understated and precious and lovely. Above are highlights from the special fashion exhibit at the Chateau de Haroué. Among the most stunning gowns designed by Givenchy are the long black dress worn by Audrey Hepburn in the opening scene of 'Breakfast at Tiffany' (in which Hepburn departs a cab, munches on a Danish, and gazes wistfully into the windows of Tiffany, after removing her sunglasses. 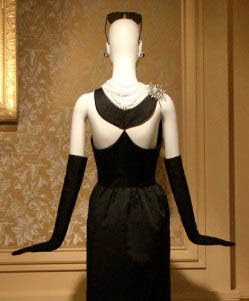 The group of three black gowns were designed by Givenchy. The cream Duchesse satin embroidered gown and opera coat, by Givenchy, was worn by Jackie Kennedy to the Opera Garnier in Paris, on a state occasion. 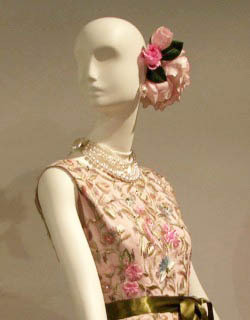 The exceptional embroidered gown (model has flowers in her hair), designed by Balenciaga, is entirely embroidered on palest pink tulle over silk, to shimmering effect. 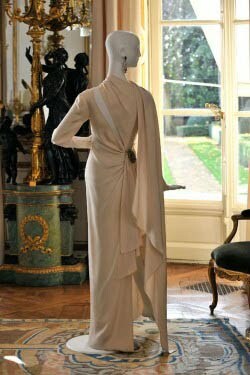 The ivory silk crepe gown with artful stole included was by Philippe Venet, the long-time partner of Hubert de Givenchy. Gowns in the exhibit date from the early sixties to summer 1990. The exhibit ends, classically with the cream silk faille wedding gown of Princess Minnie, designed by Philippe Venet. I stepped into the circular Pillement room, in the west-facing turret. Vivid linden trees and a boscage of sycamore and chestnut trees formed a lacy green screen curtain at the open windows. The finale of the fashion exhibit was a collection of archival videos showing the gowns making their first appearances on Queen Fabiola and Audrey Hepburn, Princess Grace and Jerry Hall and Mona Bismarck (who owned more than 300 of Balenciaga’s designs). In a grainy video of one of the last Givenchy runway shows, 1992, I caught sight of my dear friend Tatiana Sorokko (see THE STYLE SALONISTE archive) modeling a sweeping gown with a rich emerald silk skirt. I wandered back into the exhibit to see it all one more time. The scent of orange blossom lingered in the eighteenth-century air. Book cover of the handsome volume dedicated to the fashion exhibit. I walked down the lichen-covered stone steps and into the garden, the turrets looming on either side reflected in the moat. Terry’s avant-garde all-green concept (a no-flowers mandate now favored by classicist genius Jacques Wirtz) was to reject overwrought ornamental parterres that usually accompanied historic chateaux. 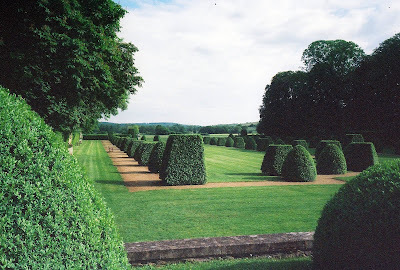 Carefully placed and positioned yew pyramids and cones stand like sculptures across the lawn. Their dimension and the peaceful monochrome give the garden an air of tranquility and grace. I walked down to the left, along a clipped hedge, and lingered on a teak bench in the shelter of chestnut trees. 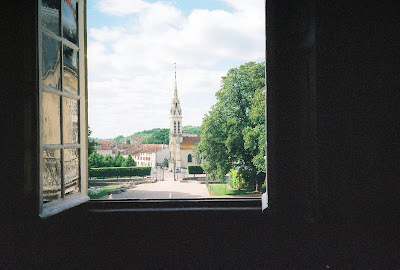 I gazed up to the chateau and then across the lovely Lorraine landscape edged with meadows of buttercups and daisies. Bullfrogs croaked. A tintinnabulation of bells rang out the hour from the village church. Doves cooed. Insects circled. A cacophony of crows whirled in the blue sky. And yet there seemed centuries of silence, the peace of the French countryside in early summer. To punctuate the ordered scene, a pair of weathered stone sphinxes is positioned just at the bottom of the lawn before a meandering stream breaks up the symmetry. The sun was slanting across the garden as my watch showed 6.30. 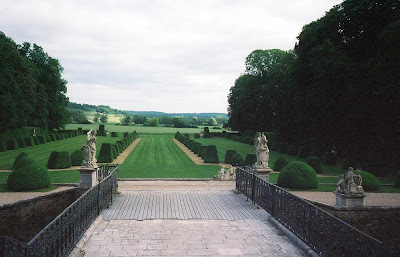 The Princess suggested that I might like to view the newly completed English garden designed by Didier Misler (“He’s a genius with peonies,” said Princess Minnie). Bees buzzed drowsily among clouds of sweetly perfumed Philadelphus (eat your heart out, Jo Malone). Borders o mauve and pale cream irises and rare yellow peonies, white dianthus, Cecile Brunner roses, and Daphne were planted in impressionist borders. Eventually I left to catch the train in Nancy. This had been the most memorable private visit, and an incredibly heartfelt one. Princess Minnie grew up at the chateau. Weddings and holidays and birthdays have always been celebrated there with panoply and pomp amidst her international illustrious family and regal friends. 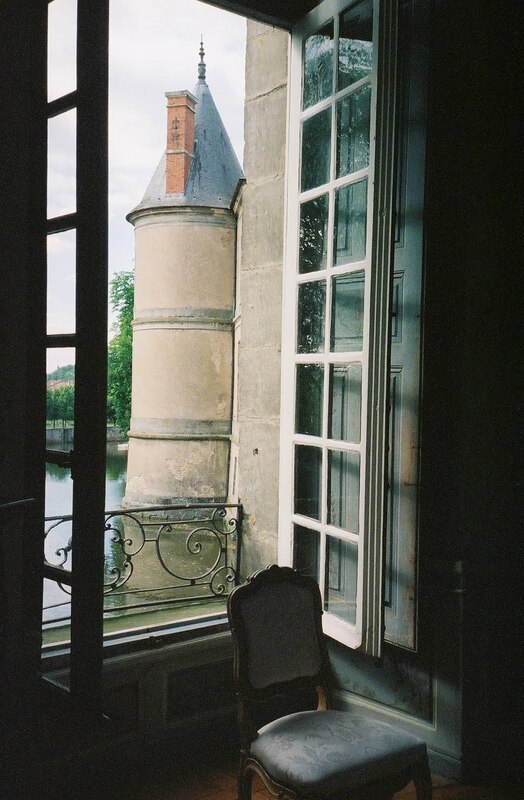 The chateau reverberates with her kindness and her careful protection of her heritage and France’s patrimony. I could not be happier with this encounter. The scent of waxed parquet floors and chestnut blossoms lingers as the TGV speeds through the shimmering wheat-fields, back to Paris. Photographs of the garden and exteriors were shot by Diane Dorrans Saeks, in June 2010. Images of the fashions of Givenchy, Venet and Balenciaga, used with kind permission of Princess Minnie de Beauvau-Craon, Chateau de Haroué. 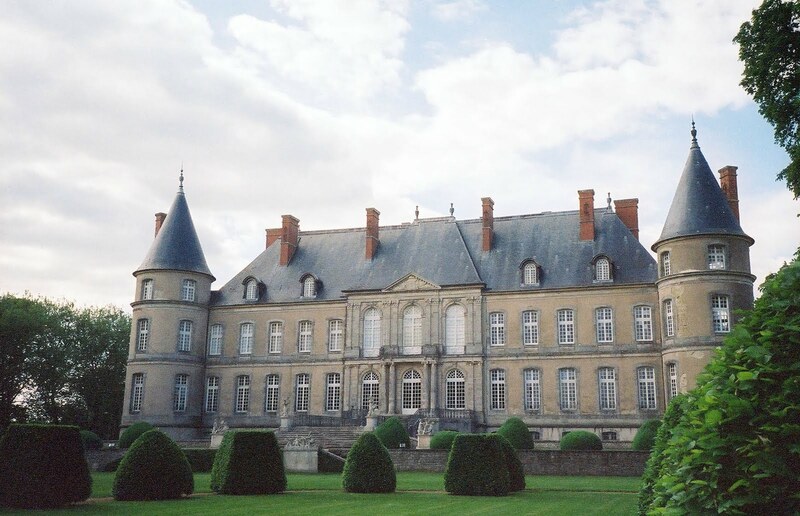 Note: There are several books published on the Chateau de Haroué in French and in English. I acquired the best one, 'Haroué' by Christine de Nicolay-Mazery at Gallignani in Paris. (It's beautiful, published in French only.) 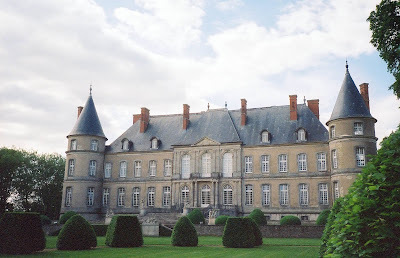 'The French Chateau' also by de Nicolay-Mazery was published in French and English and is findable through Amazon. 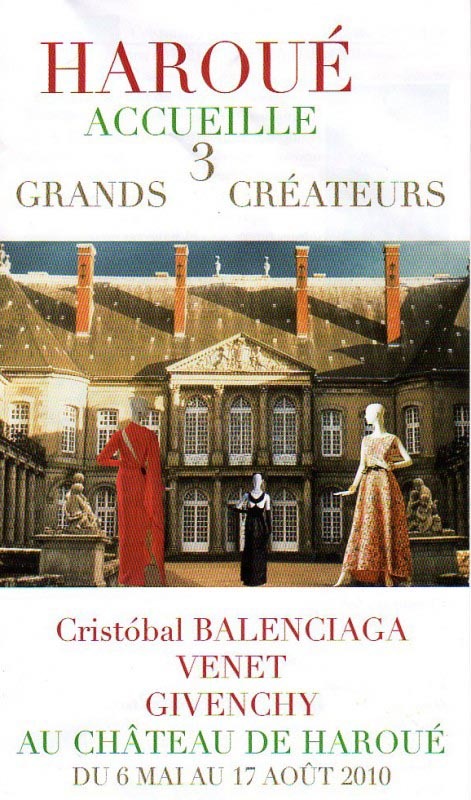 A delightful overview of the fashion exhibit, a book called 'Balenciaga Givenchy, Venet' was published by Flammarion in France and will be published by Rizzoli next spring, 2011. I don't know where to begin - there is such beauty throughout this post! 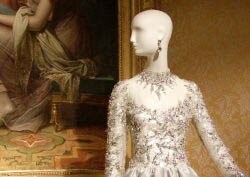 From the chateau to the breathtaking Givenchy gowns, such art for the eyes. I adore the wedding gown he designed for the princess. Oh my lord! I am absolutely reeling with the beauty of it all! So beautiful, and so beautifully written! Thank you, Diane! How lucky are we you didn't heed the advice to make your blog "shorter"!!! Hello, Stefan--Thank you for your kind comments. I hope you will go there when you are next in Paris. Any time of year would be lovely--though early summer is magical. Even at 6pm it felt like the middle of the afternoon. 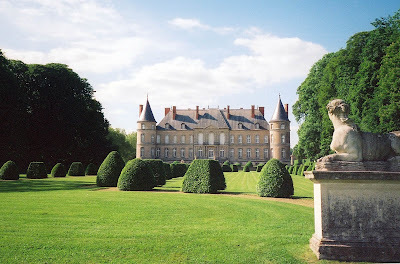 Note that this is a living chateau...the family is there...so it feels alive and loved and protected. Hello, Jennifer--Lovely to hear from you. This was incredible fortune to see both the chateau (worth the trip, anyway) and then the glorious couture show arranged and suggested by M. de Givenchy. 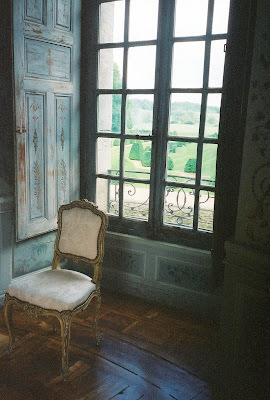 I can tell you that to be alone in these vast rooms, with gilding and paintings and style, and then able to linger and inspect the embroidieries and the silks and the paillettes and the crystals and adornments was such a rich experience. 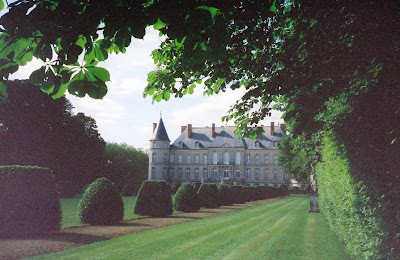 One of my all-time favorite chateau visits (I have seen many...and the private ones are always best.). Penny--Dear--you are so kind. You would have fainted (I certainly felt light-headed) at the beauty and the rare delight of such an experience. Every moment was crystalline and delicious. The gowns--all from the Givenchy archive (Givenchy is the head of the Balenciaga archive)...are pristine and so richly adorned and timeless. Any of the gowns could be worn to a ball today...Venet's dresses, especially, from the early 90s, were so contemporary and light-hearted. The garden: swoon, swoon. I wish everyone a summer afternoon at Haroue...such great beauty...even doves cooing, bullfrogs croaking in the stream among the buttercups. Glory days. Linden blossom, orange blossom- a Princess, a Balenciaga bridal gown fit for a Queen,& Saint Saens. Too much, never. Your visit to France seems to have been filled with amazing places. I would have been lost in the garden, inhaling the citrus, linden and mock orange blossoms. Mmmmm! Thanks for the fabulous tour. It looks utterly divine and well worth a visit! I have a fab watercolor sketch by a Brit of Givenchy's salon. The artist was commissioned to paint every room in his house! I really must make it out there for a look-see. Thanks Diane for the wonderful tour! 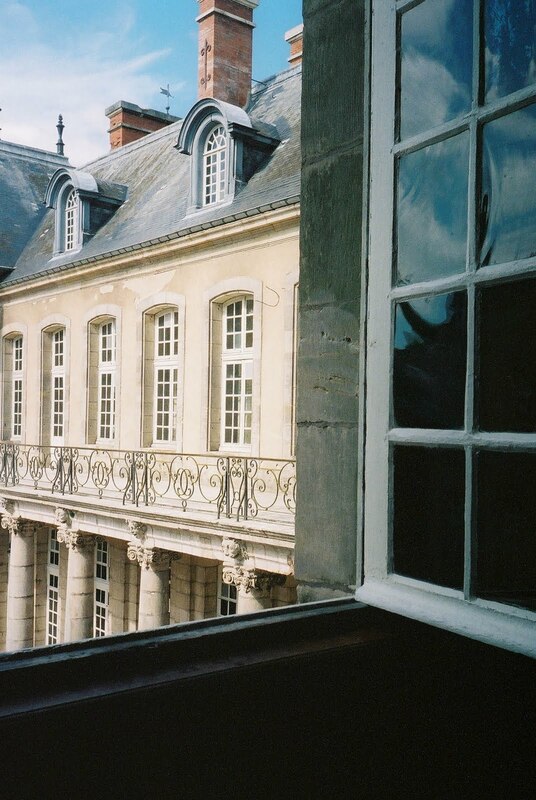 The chateau is hauntingly beautiful and I long for France now. It seems to me this is a movie in itself. Absolute magic, as ever; Diane, you've left the scent of lindens and orange blossoms with all of us. What a heavenly treat! Thank you, thank you. Dear Friends- I've received such a wonderful response to this feature and I'm so pleased! Thrilled. Thank you so much. Dear Little Augury: Linden blossoms mean summer in France for me. On a visit to the divine Courances, another private chateau, also tricky to get to, south of Paris, a few years ago, I swooned at the honeyed fragrance of linden blossoms, with bees buzzing in the sunny afternoon. Bliss. I love the French countryside. Dear Ann: I was fortunate to be able to wander in the garden, sit, wander into the forest, gaze over the countryside, and peer among the reeds that edges the stream, to see the bullfrogs intertwined with buttercups. I could hear larks, feel insects brush my cheeks, and watch beautiful cloud formations moving across the blue sky. Lucky indeed is the Beauvau Craon family--and they take their responsibility to their heritage very seriously. Dear Albrarosa: Thank you. I'm happy you enjoyed my photos. Watch for upcoming blogs--I have some very different shots from travels coming up. Hi Carol: I love your blog, Paris Breakfasts, and your watercolors of pastries and macaroons. Thanks so much for visiting. You--and I--are such Francophiles. Dear Mary: I'm so pleased you visited. Be sure to send comments. I love to hear from my readers around the world. Hi Holly: Yes, nostalgia. When I return from Paris visits, it stays on my mind. I think about experiences I want next time--a special visit, a new direction and neighborhood, a new bite, a dusty bookshop, a market like Aligre which I love, or a trip back in time. Stay tuned. Hi Victoria: Cinematic, yes. I was very present..and totally enchanted and hyper-aware--as I walked around the chateau and it was surreal at the same time. I am not sure if that Balenciaga Givenchy Venet show is destined to be mounted in a museum or elsewhere...but I have the sense that this was a once-in-a-lifetime viewing. A Balenciaga (historic) show is coming to San Francisco next year. I will report on that. My idea of heaven Diane...thank you for this wonderful tour....almost as good as going myself. Enjoy your weekend, xv. I loved your feature on the virgin statue in the garden. In the photo it looks so romantic and lovely...especially with the blue hydrangea flowers. HAROUE: In a sense this story is like my chase to visit Picasso's Chateau de Vauvenargues last year (now, forever, closed to the public)...it was a fortunate series of good timing. Minnie had been traveling to see her family, and I was uncertain if I would see her. The gods were enchanted, and certainly favored my great adventure. The day was so exquisite...and you can see the late afternoon sun slanting across the garden. France is always lucky for me...and for you. What an exceptionally lovely post. Fashion by Givenchy and Balenciaga in a superb 18th century French setting. Only Hubert de Givenchy has the taste and wisdom to conjure up something so rarefied and exquisite. I'm so glad to know that Givenchy, though retired, continues to devote his skills to things aesthetic. For those of us not lucky enough to visit the exhibition, this article has been a wonderful replacement. Love the text and the photos...outstanding!